Product Description: less text Dashing through the chocolate, in a one horse open sleigh! Get into the Christmas spirit with this beautiful arrangement of gold, silver and red chocolate stars which are arranged to resemble Santa's sleigh! With tissue paper and raffia, this unique gift will 'sleigh' them all this festive season! 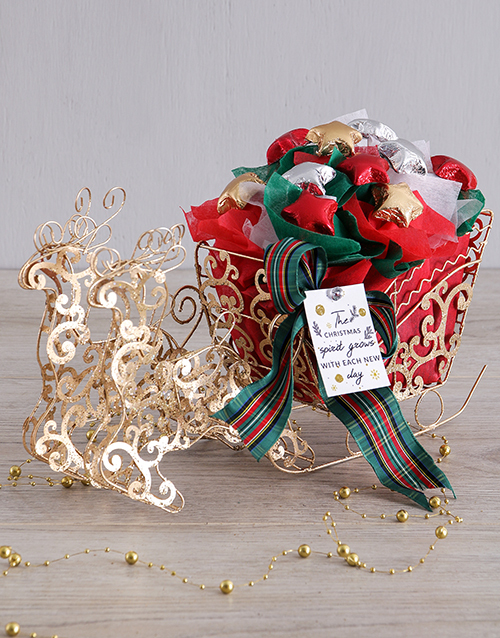 Get this Christmas Chocolate Star Sleigh delivered with NetFlorist.